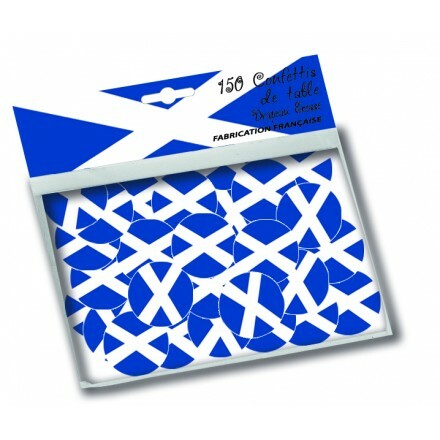 Scotland flag confetti, 150 confetti per bags, 1inch/25mm diametre. Great product to decorate your table! 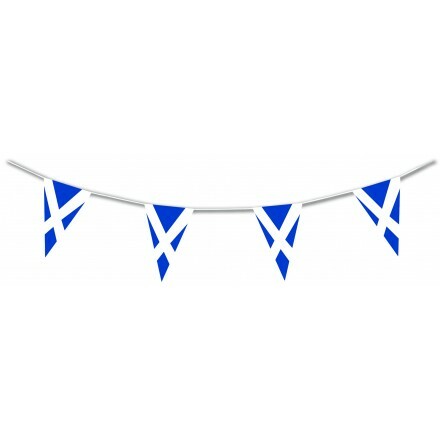 Our St Andrew plastic flag bunting also called St Andrew flag banner is made in top quality, for indoor and outdoor use. This Scottish flag bunting resist with wind and rain as high quality plastic sewn onto a very solid white thread. Each rectangular flag measures 20 x 30 cm, printed both sides. 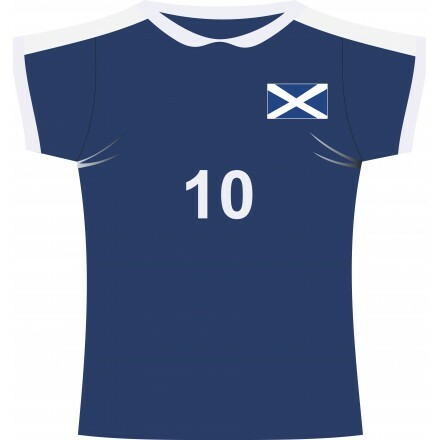 St Andrew flag is blue with a white cross. We propose two different lengths, either 5m long or 10m long. We can make other lengths, for that feel free to send us your special enquiry. 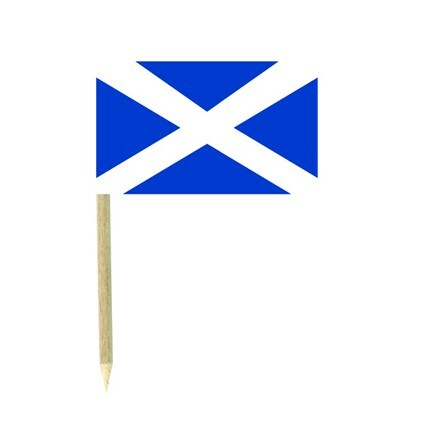 Deco Party UK makes Scottish paper hand held flags, each flag measures 14 x 21 cm, printed both sides. Each flag is on a white plastic stick 37cm long. Buy online these hand-waving flags per pack of 100 with a very low price. 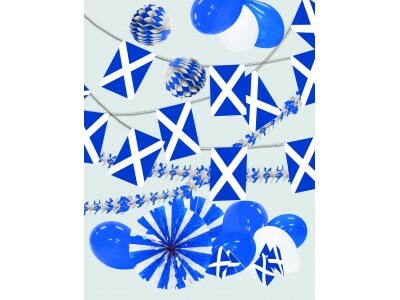 We offer a complete decoration kit for St Andrews day, all room decorations for your Patriotic event. Each pack has got 27 items. 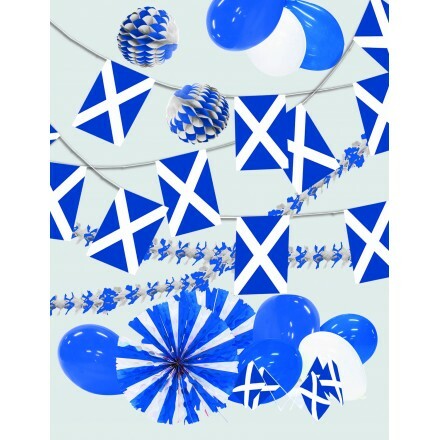 Each pack contains 1 St Andrew plastic bunting flags, 2 flameproof honeycomb balls 25cm, 2 flame-retardant honeycomb fans 50cm, 2 flame-resistant honeycomb garlands 4,50m lengths, 10 St Andrew hand flags, 10 latex balloons 25cm diameter. You can easilly give your original finish touch with this kit as you can hang some products from the ceiling for a vertical decoration, others through your room for a horizontal decoration and some bouquets with latex balloons. Sprinkle our unique and original St Andrew flag confetti on the table, round ( circle ) shape, 25mm diameter, in paper printed both sides. Perfect decoration for home décor, Pubs, restaurants, night clubs, and much more. Need a crazy table decoration for your Patriotic Celebration, This is a Scottish table decoration idea. 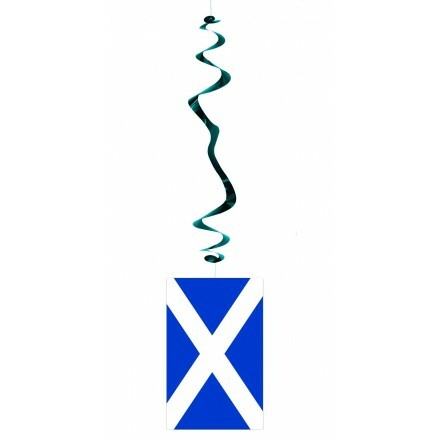 Deco Party UK propose a new items, St Andrew hanging swirl decorations. Packed with 6 pieces, each swirl is foil blue with a rectangular flag on the bottom. Complete swirl measures 80cm lengths. Perfect to be hung from the ceiling or branches of trees. 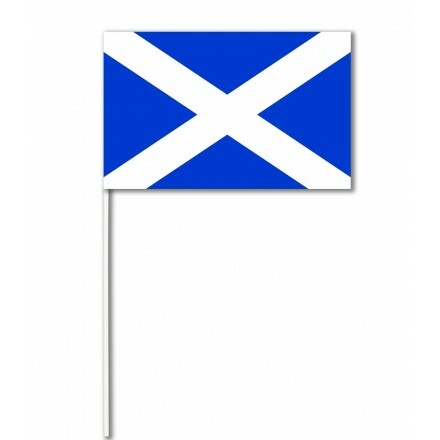 We manufacturer top quality Scottish food flags, each paper flag measures 3x5cm and is printed both sides. Food wood stick measures 7,5cm long. Great to jazz up your canapés, sandwiches, burgers, cakes, lunch and much more ! 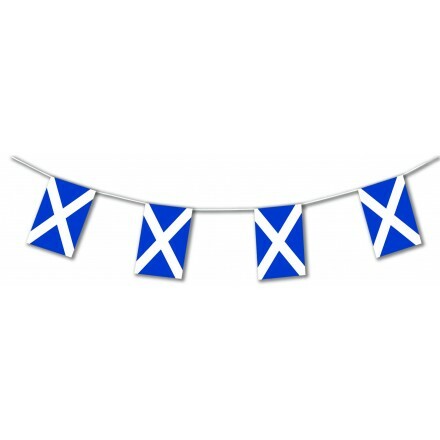 If you have been a wholesaler, retailer, reseller and you would like to buy our St Andrews day decorations in bulk feel free to send us your inquiry by email or by phone and we will study best prices to satisfy your query.